Tonight: Clear. Cold. Lows in the 10s. Tomorrow: Sunny. Chilly. Highs in the mid 20s. Monday: Light snow at the coast, sun inland. Highs in the mid 20s. It’s been an interesting ride over the last 24 hours. Record high temperatures, drenching rain, rapid snow melt, flash flooding, wind damage, river flooding because of ice jams and tumbling temperatures. After a January that got off to the coldest start in recorded history, Boston saw back to back days with high temperatures in the low 60's. Temperatures were below average the first 8 days of the month, the last 5 days have been above average. Although it’s been incredibly warm the last two days, average temperatures for the month still remain 6 degrees below average. In Norwood, I recorded a temperature of 61 degrees at 9:30 AM. The cold front moved through with a line of gusty showers around 10:00am. By 12pm, the temperature dropped into the upper 30's. Most areas saw similar drops. You might be wondering: what happened to the "flash freeze?" Thankfully, the temperature drop was accompanied by gusty winds. Those winds helped evaporate the water before it froze. Overnight, temperatures will drop back into the 0's and 10s. It would be MUCH colder IF we had snow left on the ground. Sunday, will be chilly. High temperatures will reach the low to mid-20's. The winds begin to shift from the Northwest to the Northeast. 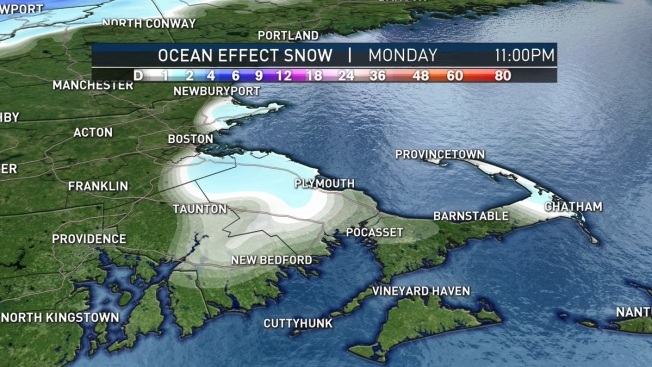 With this wind shift we will have to watch the potential of ocean effect snow. Accumulations will be minor, but it’s possible that we could see and inch or two during the day on Monday. Tuesday into Wednesday is our next chance for a little snow. It was looking like it could be another coast storm, but that is less likely. A quick moving clipper will bring us some light snow. Currently, it appears possible that we could see 1-3” of accumulation. It’s also possible that the snow changes to rain in southeastern Massachusetts. This taste of winter won't last very long. Another thaw is likely by next weekend. High temperatures will climb into the 40's and even low 50's. Any snow we gain during the week will melt by the weekend.